In 2016, with the closing of the market in the Lower Highlands, Golden Acre Farm decided to sell at the best and most active farmer’s market in Denver. We are now located at the Old South Pearl Street Market on Sunday mornings, 9 a.m. – 1 p.m. 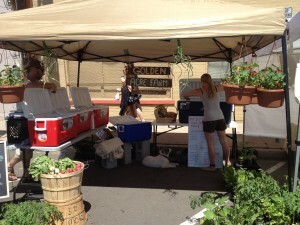 The market is located at the 1400 + 1500 blocks of South Pearl Street (between Iowa and Arkansas). Our stand is on the South end of Pearl Street. We will have our products featured in restaurants around the Denver Metro Area, prepared for you by some of the best chefs in the country. Our main restaurant supporters are Scratch Burrito, the Bon Appetite Café at Regis University, and Lucky Pie Pizza. You can find us at our farm sites in Golden and our small satellite flower site in Lakewood. Our Golden site is at 4390 Easley Road and our small Lakewood site is at 30 S. Garrison Street. Our flowers will also be available at More Flowers (www.moreflowers.com) in beautiful hand crafted arrangements. Please inquire with David about arrangements that contain Golden Acre Farm organic flowers. You can also find us on facebook, www.facebook.com/goldenacrefarm, and you can follow us on twitter @goldenacrefarm.